X_STUDY provides the ability to display two or more technical indicators in the same chart area pane. Right-click the chart and select Technical Indicators... from the context menu. 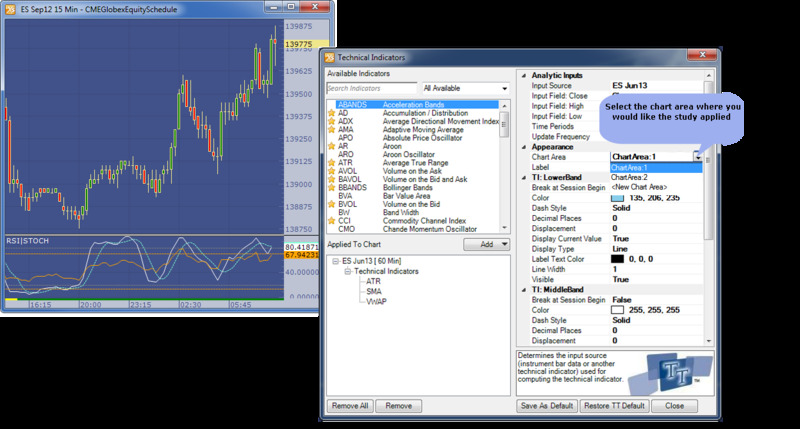 This displays the Technical Indicators dialog box with a list of available indicators. Select the first technical indicator. Modify indicator parameters using the fields displayed in the Technical Indicator Properties section found on the right-side of the dialog box. (Optional) For example, select the Chart Area property available in the Appearance section. Click the Add button. This displays the technical indicator in the Applied to Chart section of the dialog box. Select the second technical that you would like to use. Click the Chart Area field in the Technical Indicator Properties section of the dialog box and select the area of the first technical indicator in the drop-down list. Click the Add button to add the second study to the chart. This displays the technical indicator in the Applied to Chart section of the dialog box. Click the Close button to close the Technical Indicator Properties dialog box.